It does not take one long to realize many RVs take the same locker key, CH751. I replaced the cylinder locks with different ones. Just had to move the finger-pull to the other latch since the new 1 1/8” cylinder lock was a bit too short. I don’t care all that much about how my hair looks. So I bought a Wahl home haircutting kit. They range from $20-45, I got the $25 one and it came with way more attachments than I’ll ever use. The first time I tried cutting my hair, I was looking in a mirror. That certainly did not work well. I learned to just go by the feel of how the depth guard was moving across my head. Much better. I could give myself a really good haircut if my head was sitting on a table. But then I would have the being-dead issue. Why is a ‘w’ called a ‘double-u?’ Looks like a double-v. The Latin alphabet did not have a letter to represent the W sound in Old English. So scribes of the 600s wrote it as ‘uu.’ The letters meshed over time, as we see if written in cursive. One day I got buzzed by a hummingbird, so I dug out sugar I had left over from last year and boiled up some sugar water. The bird did not come around again until the following morning. Unfortunately, I forgot to bring the feeder in for the night. Can you guess? The bird stuck its beak into a slotand hit ice. What the …?! He tried it another two or three times and flew off. The next night I remembered to bring the feeder inside. I finally got the flat-spot roughed out. I need to fine tune the leveling and rake out excess rock. I hope to get some ground cover growing when the rains start. I’ll soon be repositioning the Nash. While it’s still cold in the mornings, I wanted the back window facing the rising sun. But it wasn’t just about a flat spot for the Nash. I had to dig out an area big enough to 3-point turn the Nash so I could get back down the access road. The Dodge/Nash rig measures 42’ so it took a lot of work; cutting down the uphill slope and building up an area to back onto. And I’m still working on the access road. Should have it all done sometime this summer. Going to have to celebrate somehow. Remember this photo? This is the spot when I first purchased the property. I know, I know, looks like I trashed it but green will come back. I came across this house while on a hike. It has been abandoned for years. The house is on a nice secluded spot with great views out the windows. I like it; it certainly has potential. If it was mine, and it won’t be, I’d definitely add some color and a deck. It looks like a bank repossessed it. that he was fully alive. This shot was taken on one of my hikes in the Canyon Rims Recreation area when I was back in southern Utah. It’s been a while. I enjoy a glass of wine in the evenings while reading and listening to music. I’ve handled many wine bottles over the decades, so I was bound to write something about them in these pages. Wine has been stored in various containers for thousands of years but the glass bottle and cork combo didn’t arrive until the 1600s. Glass wine bottles come in various shapes depending on the type of wine and in over a dozen sizes. The large novelty bottles are named after biblical figures and predominant kings of Israel. The largest, 18 liters, 24 standard bottles, is named after Melchior (a king of Persia, one of the three wise man) and Solomon (a king of Israel). That’s two cases of wine! How many wine drinkers does it take to pour from a Solomon bottle? In 1975 the European Legislation on packaging declared that wine could be sold only if packed in certain measure containers. So how was the size determined? Well, as I understand it, one guy’s wife told him if he didn’t choose the size bottle her brother’s shop was making, he’d be sleeping on the sofa. I might have got that wrong. The 750 ml (0.75 liter – 1/5 of a gallon) size was determined to be the most convenient for both winemakers and the public. There are different theories to explain this size. As you know, back when wine started to be stored in glass bottles, the bottles were made by glass blowers. So one theory is based on the limit of pulmonary strength. 750 ml pretty much capped it. Another theory is the quantity of wine per six serving glasses (125 ml) used in a small Italian restaurant, an osteria. A third one points out that the 750 ml standard is the metric adaptation of the fifth, which was standard in the US and Britain. Then there are the different shapes and sizes of wine glasses. Although, at this time, I think that would be pushing it. I met an interesting couple of ex-teachers taking a road trip in their Scamp. They painted the bottom half of the Scamp, so theirs stands out from the norm. Nice. They live in Ruidoso, maybe 60 miles north of Timberon, in the Sacramento Mtns. Had a really nice visit. Wish I had more experiences like this. I heard on NPR that there are some hummingbirds that winter as far north as British Columbia. Remember, I only have daily web access for a few weeks each winter, so I can be way behind on common knowledge. On my town runs during the rest of the year, I do not spend any more time on the web than it takes me to drink a medium Americano. Anyway, when I heard this about the birds, I questioned how they could survive. I mean, they do not have down feathers and they need to be taking in so much nectar. Hummingbirds have nearly 1000 feathers on their body, a ratio of more feathers per body size than that of any other bird species. I think they can fluff them, so that could help. Although I might be wrong about this. It’s mostly Anna’s hummingbirds that are found that far north, but three others are named to a lesser degree (at least from the four sources I pulled data from). It’s individual birds that remain in the north for the winter. I wonder what brings a bird to go against the odds. The hummingbirds are taking advantage of widely planted flowering plants and shrubs, and hummingbird feeders. I would guess that it would take much more of a commitment for those who maintain their feeders through the winter. I wonder if they bring their feeder in at night. The little ones go into a sort of nightly hibernation, a really deep sleep. They put a major damper on their high rate of metabolism by entering a state of torpor where their metabolism will lower to roughly 7% of normal. This state can save up to 60% of their available energy. Hummingbirds also survive in the high Andes. I wonder if they are just on the west facing side. In winter, hummingbirds are slow risers. It takes 20-60 minutes for a hummingbird to fully recover from topor. Care to guess what is the first thing on their mind? They eat 25% of their daily intake as soon as they recover. I don’t know. If I was a hummingbird, I think I’d stick with the general consensus and head south. But then again, not all birds make it through the trip. Two things about a different kind of bird. Yesterday, I caught the end of a talk on birds of prey. As you know, an owl’s eyes are in the front of the head, and, the eyes cannot move in the sockets. So they need their awesome ability to turn their head 270 degrees to each side. There are sites that explain how owls are able to do this; definitely worth a visit. Owls also have asymmetrical ears, with one being lower than the other. This aids the triangulation of sound. Way cool birds. This past week, once again, I’ve been set up in goat’s head country. Bummer. M&M go out, pick up these nasty sharp stickers, come back in the Nash, use their teeth to pick them off their feet, and drop them on the floor. Remember, I do not were shoes inside but I do sweep the floor once or twice a day. Sometimes that is not enough. If I miss a goat’s head, I’m the next one picking one off the bottom of my feet. Guano. The joys of sharing one’s life with feline companions. At the beginning of last summer, I made a deal with myself. 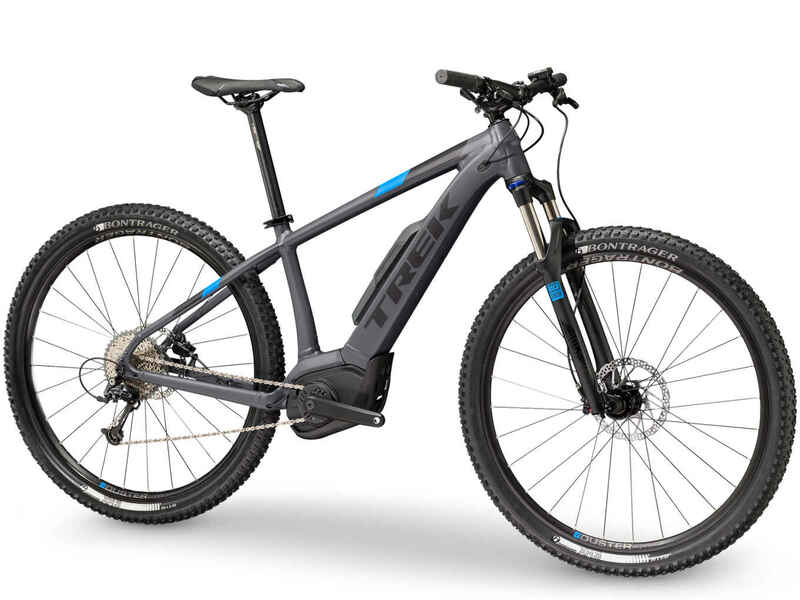 If I got back into as good a shape as I was a few years ago, I’d purchase this e-MTB (electric mountain bike). I have the experience and knowledge to achieve this in maybe three months. I would just have to keep my mind focused on the long-term goal over the coming months. This is not the type of electric bike one just sits on and is pulled along by the electric motor. I mean, seriously? It’s me. 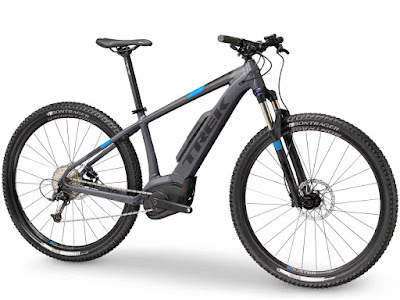 The Trek Powerfly 5 is a pedal assist, 10-speed with different modes. Pedal assist means one must be pedaling to tap into the electric assist. No free ride. The bike has an approximate range of 20–100 miles depending on the power mode (4 in all), terrain, incline grade, wind, and one’s riding style. 20 mph is the top-assisted speed, at which point the assist cuts off. The bike can go faster, but it will be all pedal power. The bike comes with stellar components, including hydraulic disc brakes, a Bosch electric motor (the best), and 29” wheels, which I prefer. The power goes to the crank rather than the hub, as with lesser-priced e-bikes. Power to the hubs can cause broken spokes. Not good. As I understand it, one can get all or most of the power through pedaling, with no, or only a little assist. Otherwise, I would think of it as a pretty lame way to bike. One could start off a long ride peddling out for miles with no, or only a little assist, and when beginning to tire, switch on more assist to get back. This bike would extend the miles and also give me access to more steep slopes. All in all, sounds pretty good. The Trek Powerfly 5 is $3600. I could justify it if I met my goal. I did not, hence, no bike. My own fault, I didn’t put in the effort. Maybe another time. I like how the paint turned out in your Nash, Rob. It makes the interior look cozy, warm, and homey. Good job. I wasn’t familiar with Milk Paint that you used so I looked it up. 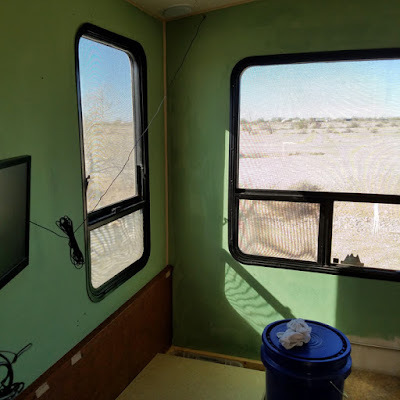 Sure seems a much healthier way to go when painting a RV’s interior walls. Smart move. Did you buy pre-mixed or did you mix your own. I thought you were only going to paint the galley wall. Are you going all around? The winter solstice, my favorite day of the yearrebirth of the sun. The shortest day of the year kicks off six months during which we gain back six more hours of daylight. The solstice has been celebrated for thousands of years as a sort of birth of light, with light being a big part of the celebration. to operate positively in the world.